Note: This is the bound book only and does not include access to the Enhanced Pearson eText. To order the Enhanced Pearson eText packaged with a bound book, use ISBN 0134057260. Acknowledged as the most comprehensive, easy-to-read introduction to social welfare policy available, Social Welfare: Politics and Public Policy, 8/e, emphasizes the current political aspects of policy making and major social welfare programs, including public assistance, Social Security, disability, health insurance, child welfare, and much more. Social Welfare does more than describe the major social welfare policies and programs; it also tackles the conflict and controversies involved in the processes and outcomes of policy making. It contrasts rational and political approaches to policy making, policy analysis, policy implementation, and policy evaluation. The authors present conflicting perspectives, encouraging students to think critically, to debate, and to consider their own views on issues. The Enhanced Pearson eText features video links and embedded assessments. Diana DiNitto is Cullen Trust Centennial Professor in Alcohol Studies and Education and Distinguished Teaching Professor at the University of Texas at Austin where she teaches courses in social welfare policy, alcohol and drug problems, research, and pedagogy. She has a MSW degree and a Ph.D. in government from Florida State University. She has worked in detoxification, halfway house, and outpatient chemical dependency treatment programs. She is also coauthor of Chemical Dependency: A Systems Approach, Fourth Edition (Allyn & Bacon, 2012) and Social Work: Issues and Opportunities in a Challenging Profession, Third Edition (Lyceum Books, 2008). Her research is on substance abuse, violence against women, and social welfare policy. She is a Fellow of the American Academy of Social Work and Social Welfare and serves as a member of its Social Work Grand Challenges Executive Committee. Dr. DiNitto has served on the boards of the Council and Social Work Education, the Association for Medical Education and Research on Substance Abuse, and the Texas Research Society on Alcoholism. She has been a visiting professor at the University of Hawaii at Manoa, University of Illinois at Urbana-Champaign, University of Sydney (Australia), and Tallinn University (Estonia). She is an advocate for better-informed drug policies and often speaks on the subject. David Johnson is an Associate Professor of Social Work at Millersville University. He teaches courses in social welfare policy from both economics and legal frameworks perspectives as well as macro practice and human behavior in the social environment across both undergraduate and graduate social work programs. He is a mediator certified to practice before the Texas courts and has developed electives in mediation at both the undergraduate and graduate level at Millersville. 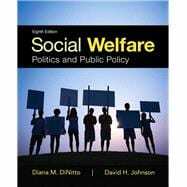 Dr. Johnson is the coauthor with Diana M. DiNitto of Essentials of Social Welfare: Politics and Public Policy (Allyn & Bacon, 2013) and co-authored two chapters in the Seventh Edition of Social Welfare: Politics and Public Policy (Allyn & Bacon, 2011). He has also authored or co-authored a number of instructor resources for Pearson in the policy area over the past several years. He has presented at numerous national and regional conferences. He was previously affiliated with the Health Behavior Research and Training Institute at the University of Texas at Austin. Prior to that, he served as Executive Director of AIDS Services Coalition of Hattiesburg, Mississippi. He has served on numerous boards of directors in several states and currently serves as President of the Lancaster County (PA) Medical Foundation. He is a member of the Council on Social Work Education. 4. Ending Poverty: Is It an Issue Anymore? 8. Providing Healthcare: Can All Americans Be Insured?